UNITED NATIONS, April 7 -- Two days after the Press was unceremoniously told to move back from the UN Security Council because two Permanent member nations wanted less "involuntary interaction" with reporters, Inner City Press asked last month's Council President from Gabon about the controversy. He confirmed the complaints, but ascribed them to a lack of any controls when the Council first moved to its new location in the UN basement. Meanwhile the Council's 15 members met Wednesday afternoon and heard a proposal from three representative of the UN Secretariat. Inner City Press stood alone in the still limited stakeout area when the three emerged at 4:15 on Wednesday. They heard our proposal and are discussing it, Inner City Press was told. The proposal involves moving the stakeout back up on front of the Security Council, allowing a similar stake out by the first floor Delegates' Entrance, and trying to allow journalists to walk up the same stairs as diplomats. (Imagine that). One of the Permanent Five ambassadors named as having triggered the restrictions backtracked and expressed support for press use of the stairs. The host country, which on Monday denied having begun the discussion, still refers to safety concerns. "We fully support the United Nations Correspondents Association in its opposition to proposed new restrictions on press access to UN Security Council members. The public will see straight through the argument that delegates’ safety is enhanced by keeping them shielded from the press. Both diplomats and reporters are already inside a secure zone with visible ID. The United Nations should be a beacon for the human rights it was established to uphold. Those include freedom of expression and a free media. To deny reporters access to public officials would be hypocritical." But hypocrisy is sometimes the norm at the UN. We'll see -- watch this site. At UN, Deal on Press Limits Faces Safety Block, Turf War Council Meeting Called? UNITED NATIONS, April 7 -- In the hall of mirrors that is the UN, it wasn't clear under whose authority the Press was pushed back from the Security Council's new basement home on April 5. After a day of reporting and fight back, April's Council President Yukio Takasu of Japan on April 6 told Inner City Press that media access should not be reduced, and would be negotiated. Video here. Later on April 6, five reporters including this one accompanied the media liaison of the UN Department of Safety and Security and three Department of Public Information officials in front of and above the Security Council suite of rooms. The DPI representatives assented to access at street level, from the Delegates' Entrance to the stairs. Then to an enlarged pen in the basement, shifting the non-Council member states to south of the stairs. But the UN Security representative, who previously told Inner City Press that "your table's gonna move," said that it was all subject to re-negotiation. One of the DPI officials told Inner City Press after close of business on April 6 that the following day -- today -- they would meet with the Security Council members to "seal the deal." Which Council members, Inner City Press asked -- all 15 or only the Permanent Five? A representative of the UN's Security Council Affairs branch on April 5 said that there was no reason to meet with the Council's president from Japan, since he and his country are transient members. 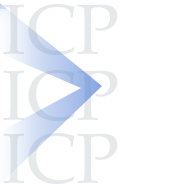 But now, Japan is requiring that all 15 be met with, the DPI source told Inner City Press. Which members will stand for press access, and which against? France, whose Ambassador Gerard Araud began the complaining about the press in the Council's consultations on April 5, now said it agrees the Press must have access to the staircase and both lobbies. 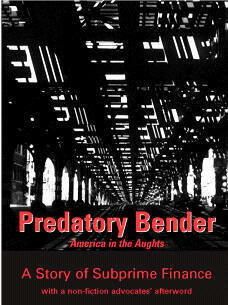 The hang-up, it emerges again, is the United States, according to well placed sources. The US Mission has denied they first raised the issue. But who is keeping it going, under the guise of safety? Watch this site. 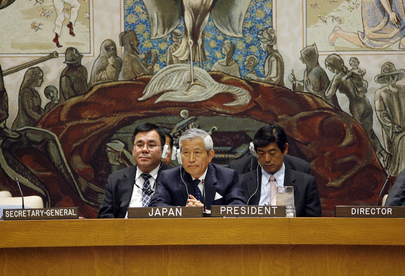 Footnotes: unaddressed by President Takasu is the question of who moved to bar from consultations UN Peacekeeping and Political Affairs staff, and the Office of the Spokesperson, and why? When Inner City Press asked Takasu this on camera at the stakeout, he turned the question back to press access, on which he promised action. Video here, penultimate question. But who on the Council is so concerned with leaks that they are willing to leave DPKO and DPA, which do the actual work, in the dark about the Council's views? The suspicion is the Council most upset about the North Korea leaks, later accused of leaking, perhaps only through Nairobi, the Somali Sanctions report. We will have more on this. We end with this telling vignette. As the reporters and staff of DPI and DSS milled in the Delegates' Entrance, Sudan's Permanent Representative, his mandate just renewed, asked how he could help. Inner City Press asked him, "Do you support press freedom?" His answer, "Not always," drew laugher from the UN officials. But this is what emboldens them. UNITED NATIONS, April 5 -- Outside the first consultation meeting in the new UN Security Council chamber, both reporters and members states not on the Council were Monday in disarray, on the verge of losing even more access. A representative of UN Security Council Affairs told Inner City Press that the media will be moved further back, where they can't even see Council members enter. And member states other than the 15 Council members will be relegated to an open hallway by the stairs, under the plan. The UN representative said that Council members complained of "involuntary interation" with the press and even other member states "like India and Germany," wanting a way to leave without seeing either. Inner City Press countered that the media, and non-Council member states, must be consulted, but was told to quiet down. In what passes for news, in the beginning of the month consultations led by April's Council president, Yukio Takasu of Japan, the U.S. asked for a briefing about the elections in Sudan. Since U.S. envoy Scott Gration is in Khartoum appearing to praise the process as "as fair as possible," the U.S.'s request struck some as strange. Nigeria requested a briefing about the chaos in Guinea Bissau, in which the police arrested the Prime Minister last week. Apparently Myanmar will not be discussed. Ambassador Takasu will hold a press conference later on Monday. Watch this site. 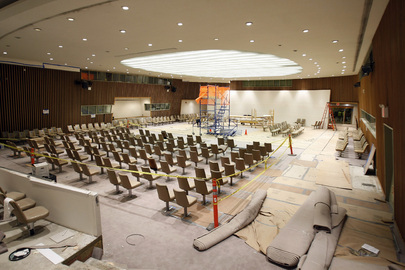 The background: After its final March meeting, the Council was moved from its longtime location on the second floor to a suite of rooms in the UN's basement. There are no windows, but the UN says it is secure, safer than Secretary General Ban Ki-moon's office atop the boxlike Temporary North Lawn Building. But outside the Council, everything has changed. The suite of rooms has a closed metal door and a sign, "Consultation in session, Security Council members only." This seems to mean that Permanent Representatives of member states not among the Council's 15 members -- including for example India, Germany and South Africa, to name a few -- can't even go into the Council's lounge, as for years they did upstairs. 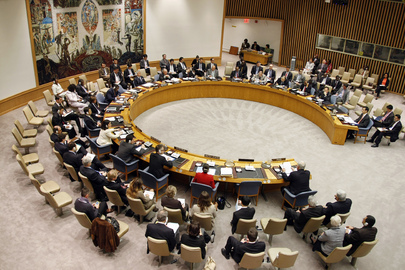 Some Security Council reform -- getting less rather than more inclusive. A stakeout with the 15 Council members' flags has been set up where the Vienna Cafe used to be. It is at some remove from the Security Council doors; members can leave by the stairs or garage without walking by the stakeout. Monday morning, reporters milled around between the stairs and the Council doors. Spokespeople of only two of the Council's members, one permanent and one in its second of two years on the Council, deigned to speak to the press scrum. By 10:15, Inner City Press was the only media left, on a rickety chair without a table by the stairs. 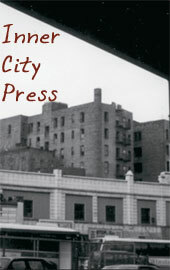 Several Permanent Representatives asked Inner City Press how to get into the Council. "Through the General Assembly," was the reply. Watch this site.